The 2008 Volkswagen R32, which marks the fifth generation of the Golf platform since its introduction in the mid-70s and the second iteration of the R32 variant, excels in competing in both content and performance against icons like the Mitsubishi Lancer Evo X, Mini Cooper S, and Subaru WRX STI – lofty company against which previous generation GTIs, including the MKIV R32, could only dream to be compared. As compared to the Evo X, which now has a decidedly Germanic feel with its move up market, arguably a coin-toss could decide between the two for one looking to fill the role of an all-rounder, everyday performance car. In fact, one could argue that for those with an active lifestyle, the versatility provided by the R32’s hatchback configuration coupled with the abundance of torque offered by the normally aspirated six-cylinder engine, gives the R32 the nod against the four cylinder, turbo charged Evo X and its more traditional sedan body. Having said that, in shooting for the stars, as a hot-hatch, the R32 may have lost the script. As much as we would have loved to heap nothing but praise on the R32, interior surfaces that shows serious cost cutting as compared to the outgoing model, a nose-heavy feel, attributable to the forward placement of the V-6 engine, together the high-sticker price, gives us pause for consideration. The just-right sports seats, race inspired flat bottom steering wheel and cavernous interior set the R32 apart from the crowd. The exhaust note, with a lovely whoofle on downshift, is sublime and the DSG gearbox is a real revelation. The fact that the R32 is subtle enough to both blend in with traffic when anonymity is desired and still put enthusiasts on notice with tasteful badging and performance cues perfectly its role of a wolf-in-sheep’s clothing. A history of failed ignition coil packs and window regulators in previous generation Golfs, coupled with less-than-stellar warranty service from Volkswagen, make the Evo or STI a safer bet for those concerned about long-term reliability. In addition, both the Evo and STI are infinitely more tunable than the normally aspirated six-cylinder R32 for those craving additional power. The R32 is composed, sure footed, and solid, even as it rockets to triple digit speeds and takes set in a decreasing radius corner marked by gravel and an undulating road surface. It is unflappable, and confidence inspiring, and a very pleasant place to get to the task of driving with extreme focus. At the same time, when the phone rings or the mood passes, it is all too happy to play the role of grand tourer, insulating its occupants from noise and gliding along sedately without feeling out of its element. As compared to its predecessor, the MKIV R32, the MKV exhibits greater chassis composure, in particular in torsional rigidity, and the newly designed independent rear suspension truly transforms the car compared to the twist beam rear axle found in past Golf/GTI models, including the previous R32. The six-cylinder engine is willing and able, and hits all the right notes while the DSG transmission delivers quick and satisfying upshifts and downshifts with an automated throttle blip thrown in for good measure. Anyone who thinks of putting an aftermarket exhaust on this car is on a fool’s errand. Although a minor point, we would prefer a bit more induction noise from under the hood to complement the exhaust burble out back. The hatch-mounted VW badge, which turns into the release for the hatchback, is a clever trick for eliminating the grab handle found on the previous model. The flat bottom steering wheel is a nice design nod to open wheel race cars, but really serves no functional purpose in the R32 in terms of allowing easier ingress and egress into the car as it would in a low-slung racing cockpit. Though, it does look really cool. The integrated GPS and entertainment system received mixed reviews with some of our staff comparing it favorably to competitive offerings, while others found it to be lackluster and a bit behind the times. The very slick, twin clutch DSG gearbox is the obvious star of the show, and received universal praise, whether paddle shifted, or shifting on its own in Sport mode, the DSG is the ne plus ultra in automatic transmissions. Although the EPA rated 18 city, 23 highway which puts the LEV-II R32 about on par with the mileage numbers achieved by both the Evo and STI, making it class competitive. When it comes to the interior, the R32 is a mixed bag. The seats and steering wheel are both stellar as are the driving position and the ergonomics for nearly all of the driver interface items. When it comes to tactile surfaces, things take a decided turn for the worse. The shimmering silver trim can’t seem to convey whether it means to be carbon fiber or turned aluminum (it is supposed to be carbon fiber). The plastic trim piece that runs along the top of the dash, presumably to hide the raised hood line mandated by European pedestrian safety standards, gives the dash a decidedly low-rent appearance. Similarly, the grain of plastic used on the dash and door panels, feels quite a bit cheaper than the finer grain material found on the outgoing model. Lastly, the interior grab handle positioned by the driver’s rear knee begs the question of what scenario VW anticipated where a driver might actually grab for that. The MKIV GTI was a bulls-eye in terms of exterior details and proportions. The MKV R32 is a near miss. The higher hood line (thanks, European safety laws) and new bulging headlights combine for more of a pug nosed look than the MKIV, and the pinched in rear lights, again, are no improvement over the prior model. The MKV is by no means an unattractive car, but as the Evo X has taken a big step forward in both design and material quality, the MKV seems to have gone a step or two backward in the areas in which it shined brightest in the previous model. The R32 is priced fairly for its market segment. There are those that will balk at paying anything north of $30k for anything with a Golf heritage, just as there are those that will balk at paying over $30k for a Lancer or Impreza. The opinions of these folks can be discounted with a knowing smile as they happily tootle away in their Mercedes C-Class or BMW 3-Series. In reality, after experiencing the R32, it would be nearly impossible to justify paying comparable money for an A3 3.2 Quattro. 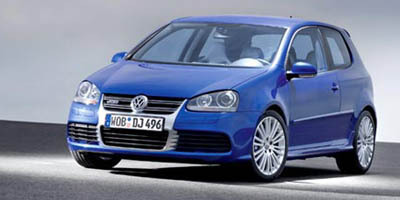 The R32 now has handling and chassis composure to match its engine performance. It is not perfect, and falls short on some minor interior and exterior design elements. We continue to question whether Volkswagen has addressed all of the mechanical skeletons in its closet from prior model years. That being said, it is a highly versatile, terrific all-rounder that should be on the short list of anyone looking at the Evo X, STi, or Mini Cooper S. As the heir apparent to the hot-hatch throne, well, the jury is still out.